This week I look at a letter Josie (Thetford) Van Every, the second wife of my great grandfather, Melvin, sent to my grandmother, Myrtle Van Every, in August of 1927. Carolyn L. Barkley at GenealogyAndFamilyHistory provides some tips on visiting cemeteries in Cemeteries and Gravestone Care. Often the best tips seem so obvious once you see them. Michael John Neill at Genealogy Tip of the Day has a suggestion for discovering the weird spellings that come up for surnames in indexes. Judy G. Russell at The Legal Genealogist examines the legal uses of Microsoft Clip Art, with some surprising discoveries. Levi Sumagaysay at Good Morning Silicon Valley shares the news that Google is requiring warrants before they turn over data from Gmail and other user accounts. The law only requires a subpoena. If this is true, Google's email service might be one of the few resisting government access to content. Randy Seaver at GeneaMusings takes a look at the Census DotMap which provides a graphical representation of every individual recorded in the recent US and Canadian census. Erin Engle at Digital Preservation offers some tips on answering the question: Scanning: Do it Yourself or Outsource? Tamura Jones at Modern Software Experiences addresses the question: One Database or Multiple Databases? Jasia at CreativeGene shares the recent announcement of a recent agreement between Jewish Records Indexing-Poland and the Polish State Archives. This is very exciting news. In Catholics, Mormons, and Genealogy at The Catholic Gene Craig Manson writes on the rift between the two churches over baptisms-by-proxy. He refers back to a 2008 post he wrote, which I recall inspired a blog post of my own. My views haven't changed since then. Some genealogists might wish to participate in author, Mary Robinette Kowal's Month of Letters Challenge. I heartily wish you a happy new year. And a grave unto him that is tired of life. And then--why, I'll try very hard not to hate him. I share this not only because New Year thoughts are still on my brain, nor only because it was written 180 years ago this month, but also because of the author. I am intrigued by a person who chooses a creative profession, when they have to bear the albatross of a father who was great in that profession. They have to know that no matter how good they are, they will always be compared to their father. I don't even have to tell you who his father was, do I? Hartley's work was considered of sufficient quality for W.H. Auden to include him in his 5-volume "Poets of the English Language" in 1950. That's where I was first introduced to his poetry. He was ranked 'among the foremost sonneteers of our time," by a contemporary. Personally, I think his work would be better known today if he had had a different surname. If you click on the photo, you can see a larger version. A toggery is an old term for a clothing store. We're uncertain what year exactly this was. According to East St. Louis City Directories, in 1907 David and his father, Morris, had a shoe store. In 1912 they had a "Clothing, Shoes, and Fur" store. (Morris actually died in 1911, but his name appeared in the 1912 directory.) 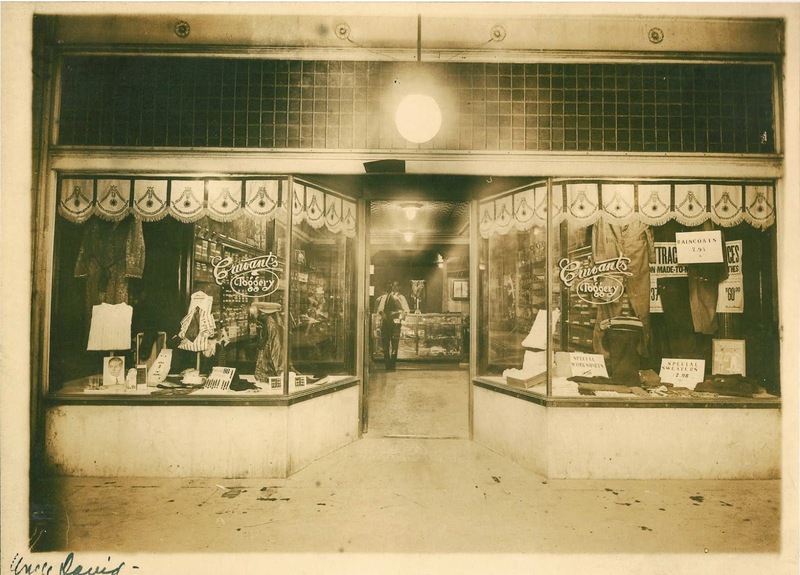 In 1920, it was still a clothing store, but by 1924, it had become a pawn shop. None of the directories provide a name for the store, but they appear to narrow the date of the photograph down to a period of about 10-15 years. This week I look at a rather extensive biographical sketch of my wife's second great grandfather, Newton Fulkerson. The sketch was published in 1893. Megan Smolenyak at the Huffington Post shares how the holiday Monday might have become Michael Luther Branham Day. Brian at Discovering William illustrates the Absolute Power of Collaboration, and why no Genealogist needs to be alone in their research. 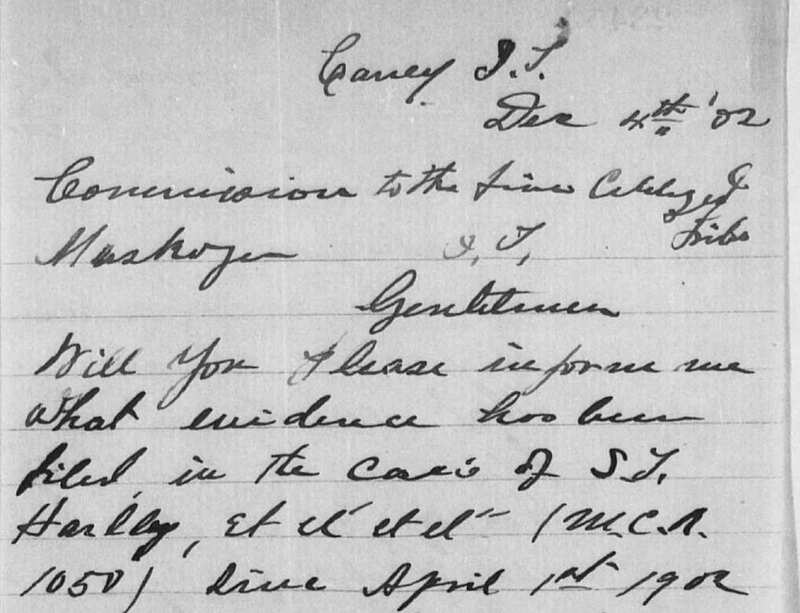 The Ancestry Insider notes that Ancestry has fixed the 1850 transcription error resulting from confusion over state abbreviations. Philip at Blood and Frogs provides some tips on accessing the Database of Polish Victims of the Nazis. The Missouri History Museum has been indexing the names that appear in St. Louis area company employee magazines. They have a fair-sized collection, but are seeking more. (MoSGA Messenger). Emily Brand at The Georgian Bawdyhouse transcribes some 18th century newspaper articles on a pick-pocketing prostitute and a winter streaker. Michael McConnell at Macgasm shows how Macs keep a record of every file that has been downloaded, and how to delete the file. 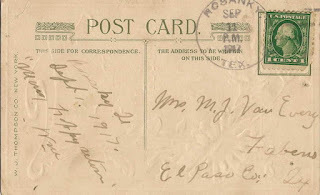 When I first saw these postcards in my grandmother's boxes, I didn't scan them in, as there wasn't much on them, and what was there wasn't very legible. But going through the collection of letters and postcards recently to see if I had missed anything, I saw them, and realized I didn't know for certain who they were from. They're birthday cards sent to my great grandmother, Margaret Jane (Denyer) Vanevery. I know this primarily because I can read the postmark date, I know her date of birth, and I can read "many happy returns." One is signed "Wm" and the other "Bro Wm." 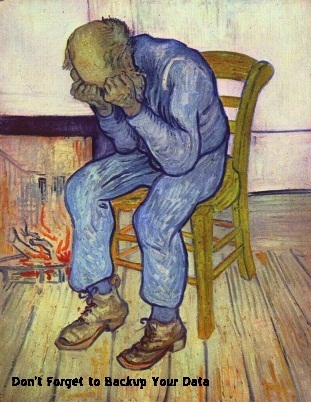 Neither Margaret nor her husband, Melvin, had a brother with the given name, William. Margaret did have an uncle, William. William Sliver Denyer was born in 1834, and it's possible he was still alive in 1914 or 1917. However, he'd sign the card Uncle William, wouldn't he? You may have noticed that I said neither Margaret nor Melvin had a brother with the given name, William. I said nothing about middle names. She had one brother, Samuel William Denyer, and one half-brother, George William Foster, Jr. 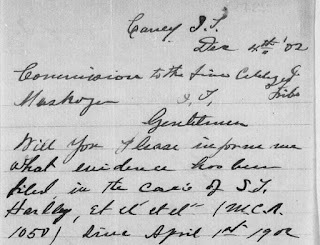 When her brother testified in front of The Dawes Commission in 1900 he identified himself only by his first name. However, the Dawes packet does make reference to him by his initials, SW Denyer, in a few places. And the packet contains a letter he wrote to the Commission. I believe the handwriting matches. So, while the postcards themselves don't have a lot of information on them, they do tell me that Samuel Denyer at least on occasion referred to himself by his middle name. 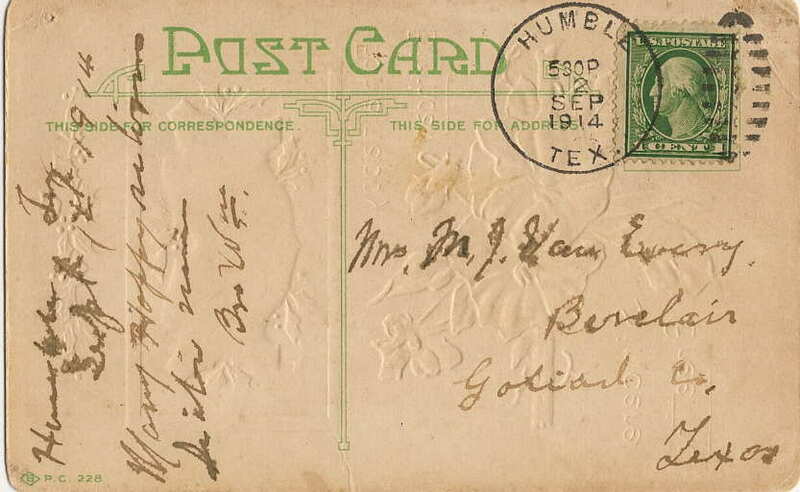 The 1914 postcard also indicates my great grandmother was living in Berclair, TX in September of 1914. This doesn't come as a surprise, as my great grandfather opened a cheese manufactory in Berclair in November of 1914. However, I believe they kept their farm in the San Marcos/Maxwell area until they moved to El Paso in 1917. In the collection of postcards my great grandmother saved, there are several from her husband's siblings. However, there are none from her half-siblings. There is no evidence that they kept in touch. There is, of course, also no evidence that they didn't. The below poem is read at many funerals. It has been attributed to several sources, but more about that below. I am standing upon the seashore. A ship at my side spreads her white sails to the morning breeze, and starts for the blue ocean. She is an object of beauty and strength, and I stand and watch her until she hangs like a speck of white cloud just where the sea and sky come down to meet and mingle with each other. Then someone at my side says: “ There! She's gone!” Gone where? Gone from my slght—that is all. She is just as large in mast and bull and spar as she was when she left my side, and just as able to hear her load of living freight to the place of her destination. Her diminished size is in me. and not in her. And just at that moment when someone at my side says: " There! She's gone!” there are other eyes that are watching for her coming; and other voices ready to take up the glad shout: “ There she comes!" This poem, and slight variataions, have been attributed to: Victor Hugo, Col. David Marcus, Margaret M. Stevens, Dr. Harold Blake Walker, Henry Van Dyke, and Bishop Charles Henry Brent. Due to the alleged attribution to Victor Hugo, and my obsession with the French author, I have been researching the origin of the quote for about ten years. In March of 2012 Google Books finally digitized a book from the early 1900s that gives credit where credit is due. The Northwestern Christian Advocate, July 13, 1904, credits the poem to a Luther F. Beecher. And the text of the poem is as given above. Who was Luther F. Beecher? Is he a retired Brookline Massachusetts minister who died in 1903? A Reverend in South Nyack, NY in 1873? The Principal of Saratoga Female Seminary in Saratoga, NY in 1858? Is it possible that the source above credits the poem incorrectly? Yes. The Northwestern Christian Advocate does pre-date all the above alleged sources except: Victor Hugo, Bishop Brent, and Henry Van Dyke. If Bishop Brent is the original source, he was young when he composed it, as he was only 42 in 1904. Henry Van Dyke was 52. 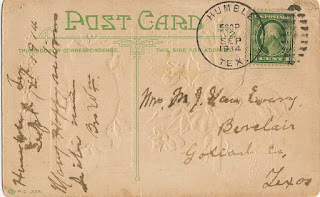 This week I am sharing a postcard my great grandmother, Margaret (Denyer) Van Every received in December of 1921. Diane L. Richard at Upfront with NGS asks the question, Do We Still Need Libraries? Judy G. Russell at The Legal Genealogist discusses Interface Improvements at AncestryDNA. Lynn Palermo at The Armchair Genealogist brings back The Family History Writing Challenge for its third year. Letters of Note posts a letter written by a 16-year-old Sidney Poitier, asking President Roosevelt for a loan, so he could afford to return to his family the Bahamas. He didn't get the loan, which is rather fortunate for theater history. Matthew Inman, at The Oatmeal, shares a cartoon memoir: When Your House is Burning, You Should Brush Your Teeth. He manages to inject a good amount of humor into the retelling, and concludes with a scanned newspaper article documenting the events. The grave of Alexander Hamilton is in Trinity yard at the end of Wall Street. The grave of Robert Fulton likewise is in Trinity yard where Wall Street stops. And in this yard stenogs, bundle boys, scrubwomen, sit on the tombstones, and walk on the grass of graves, speaking of war and weather, of babies, wages and love. An iron picket fence … and streaming thousands along Broadway sidewalks … straw hats, faces, legs … a singing, talking, hustling river … down the great street that ends with a Sea. … easy is the sleep of Alexander Hamilton. … easy is the sleep of Robert Fulton. … easy are the great governments and the great steamboats. 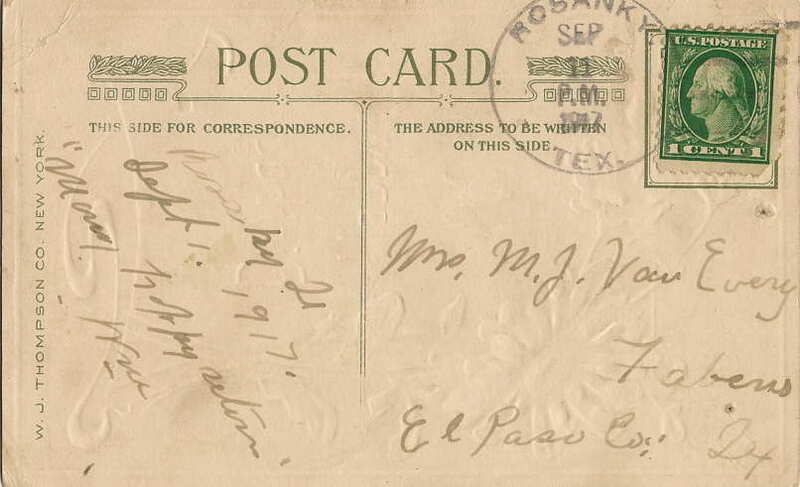 This week I am sharing a postcard I have found that my Great-Uncle Samuel Van Every sent his mother in 1908. I visited Google Analytics, and went through the search results that led people to my blog in 2012. It’s fascinating reading. Some people found what they were searching for. Others, I suspect didn't. I thought I had a unique idea when I created that Latin phrase for a poem I wrote. Apparently it has been used often to describe an African emphasis on community. I’m pleased if the transcription of my Bar Mitzvah speech helped any kid with theirs (hopefully they took ideas, and didn't just 'borrow' the entire speech) – however, I am slightly concerned since all three searches were exactly one week prior to this year’s reading of that passage. I am hopeful they were researching a year in advance, and not a week in advance. I bet they were as shocked as I was to discover this fact about Lucille Ball. But Ancestry’s OneWorldTree confirms it. I wonder how many pages of search results they had to go through before they found my blog? I am unsure why a link shows up to this blog post for these two searches. The entry only contains two of those three words. I can only imagine whoever performed those searches was disappointed by my transcription. Sid Wyman was a cousin of mine, however, it appears someone was searching for some quotes from him, in Spanish. I don't know if he knew Spanish. He was born in St. Louis, Missouri. He spent much of his adult life in Las Vegas. The surname, “Cruvant,” is Lithuanian. It comes from the town, Kruvandai. In Are You Reading the Originals Bill Dollarhide at GenealogyBlog takes a look at US Census Records, and the different copies that were made in different census years. Maria Konnikova at Slate asks "Do You Think Like Sherlock Holmes?" and wonders if our obsession with electronic devices is preventing us from both seeing and observing. Randall Munroe, of XKCD entitled the below comic, "Instagram," but the metaphor is appropriate for any free online service. The Daughters of the American Revolution were accused of removing "Jesus" from their ritual and missals. DAR clarified their position.